This year being the tenth anniversary of my arrival in Korea, I have decided to improve my knowledge of the Korean language. I can have a conversation, I can make myself understood, I've even worked as a translator on theatre projects, but I still can't pick up a newspaper and read it cover to cover. So I've got myself a lovely new teacher who'll hopefully boost my Korean up a notch and in the spirit of education I thought I'd recommend a lovely little book I found just before Christmas. 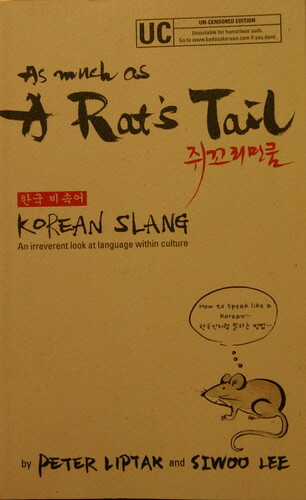 As Much As A Rat's Tail (쥐꼬리만쿰) by Peter Liptak and Siwoo Lee comes in at just under two hundred pages and is a fantastic way to learn all the words and phrases that your Korean friends won't dare explain to you. It covers such popular expressions as 고고씽 (explaining its origins and giving example sentences) as well as letting you know what you shouldn't say in front of your boss. This guide is not for the faint of heart, children or those with prudish sensibilities; but it will help adults studying Korean understand more about the culture and the language. Looks like a good book. But ever since I began learning Korean I realised I didn't want to understand what the people are me were saying... It's rarely pleasant. Thanks Paul for your comments on the book. It was fun to write and I hope everybody that has a chance to read it enjoys it as much as you. Korean can be fun and as i find more things to learn, i get more excited about this dynamic language. For Korean Rum Diary - though there may be some in any host country that look down on foreigners, i find most Koreans to be decidedly pleasant and welcoming. And though I enjoy the occasional eavesdropping, I much prefer engaging them in conversation. Show them that you care about their language (and their country) and the comments will surely be about how wonderful you are! Good luck!